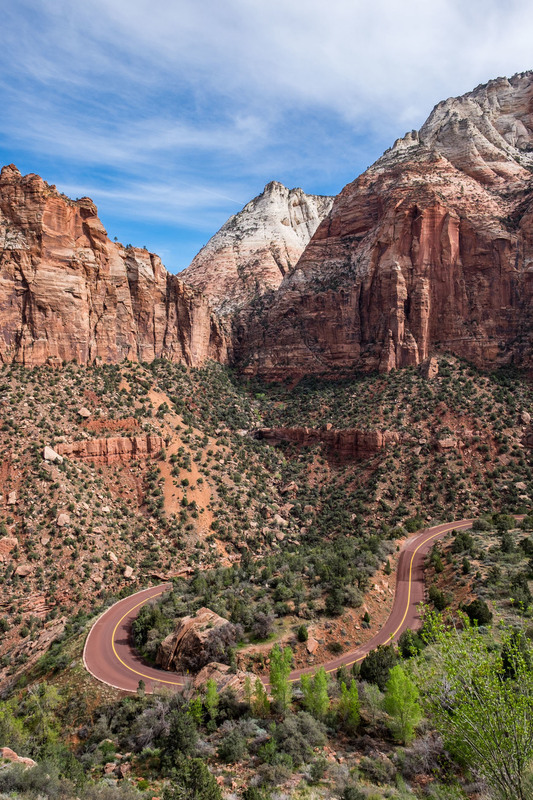 In the 1860s, Mormon pioneers settled in what is now known as Zion National Park in southern Utah. 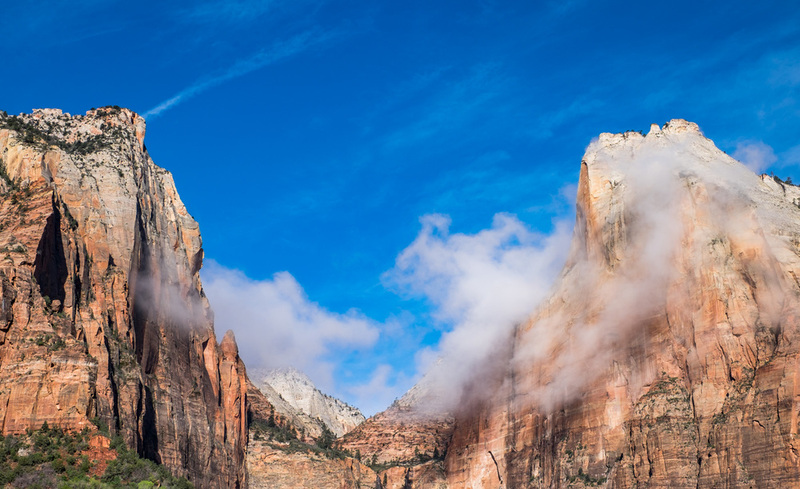 When they arrived they thought it to be so beautiful, holy with its towering natural cathedrals made of rock, that they called it Zion, a nod to Little Zion found in scripture in the Bible's Old Testament. To them, it was a sacred dwelling. It still holds a sacred reverence to all who visit it today and it is without a doubt one of America’s most beloved national parks. We are going to leave the story of the history of the park to those who can write it better, focusing in on what we know best: places to explore when visiting the heavenly landscape. 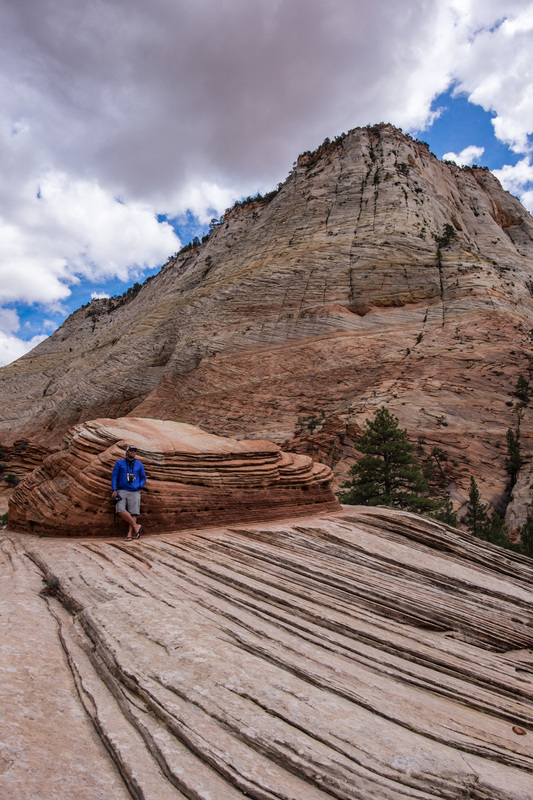 We’ve both been to Zion a handful of times and we managed to pick up some new spots to share during our recent visit. Without further ado, here are our picks for the best of Zion. Worth the hike, the light exposure, and braving the tiny parking lot at the trailhead ... the Canyon Overlook undeniably has some of the best views in Zion National Park! 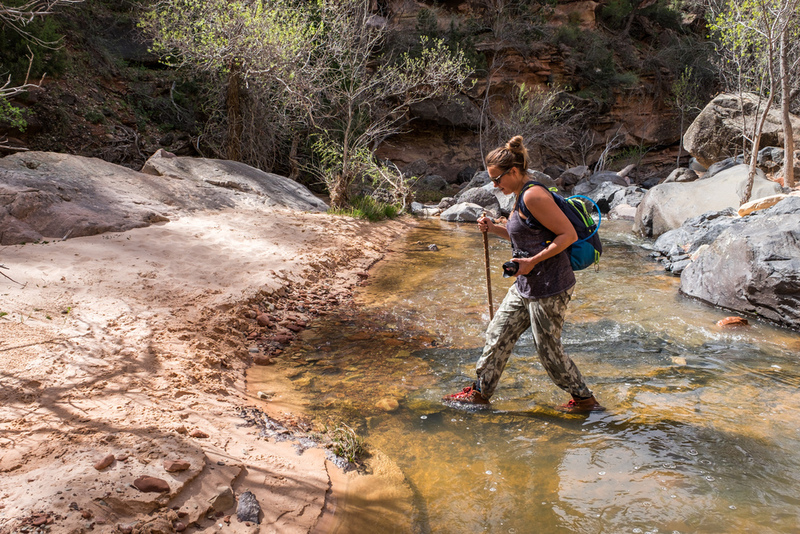 On the Subway hike through Kolob Canyons -- walking through water on a Tuesday afternoon! 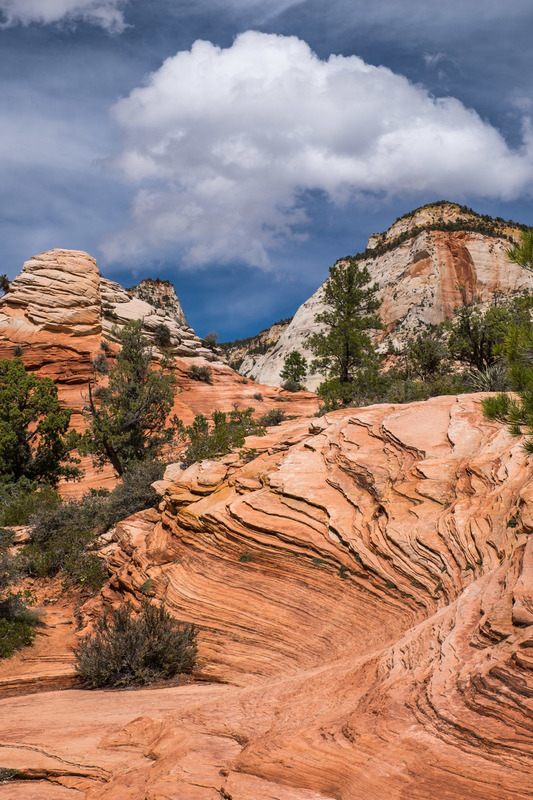 Located in the peaceful northwest area of the park and away from the landmarks that draw the highest concentration of crowds at Zion is Kolob Canyons, a beautiful off-the-beaten-path area to explore. 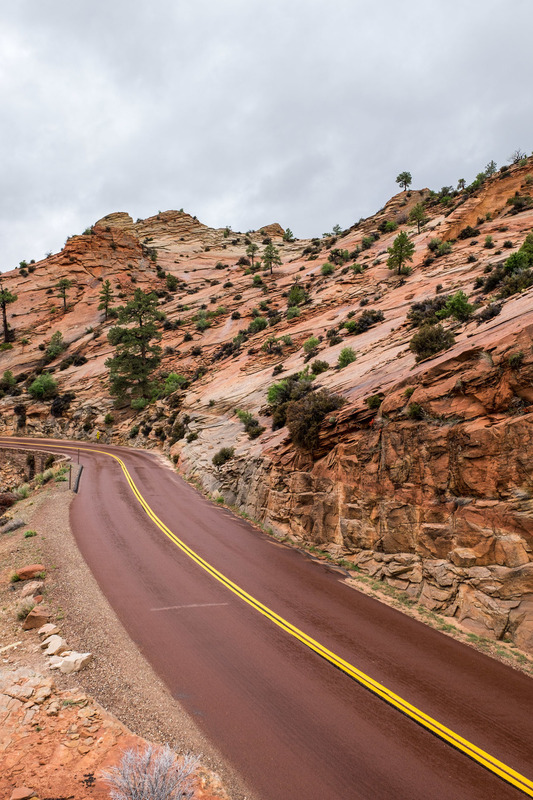 The five-mile scenic Kolob Canyon Road winds through a quiet and rugged stretch of land with viewpoint stops along the way, and provide passage to trailheads leading into incredible backcountry hikes featuring cascading waterfalls, canyon streams, and colorful Navajo sandstone. It was in Kolob where we finally felt like we had the park all to ourselves... and where we hit the hike outlined next which we absolutely loved called "The Subway." Stef strikes a pose inside of the Subway at Zion. We think it is one of the best hikes in the world! Starting from the Left Fork trailhead in Kolob Canyons we ventured out on what would result in 9 miles of pure hiking bliss! This has got to be one of the coolest trails out there as it has everything one could yearn for while tackling a big hike. There is route finding (real exploration! 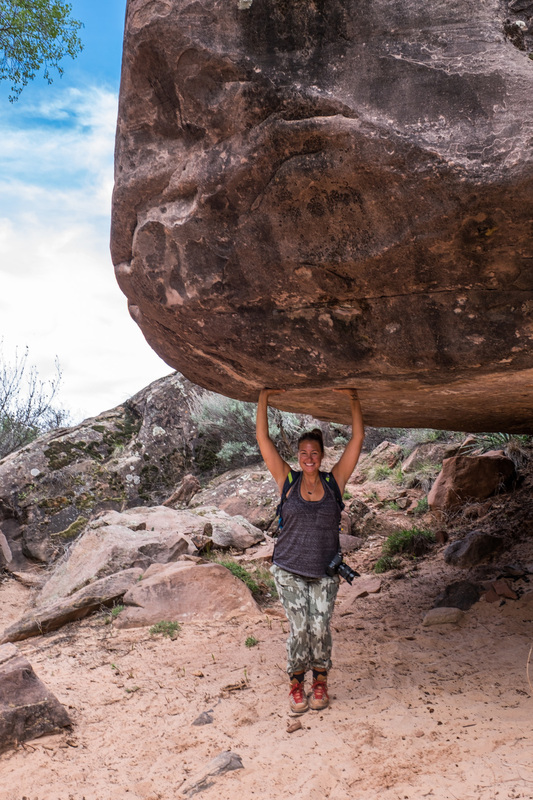 ), river crossings, bouldering, steep climbs down and back up—it’s a diverse adventure in terms of activity. And that is just the getting there. The “Subway” is a geological feature that mimics a basement train in shape. Once you are standing in the center of it, you’ve reached the end and can start the grueling hike back out (this is based on the bottom-up hike—there is a top-down hike that is beloved by climbers and canyoneers.) But that’s not all—just before you reach the Subway, you are walking through canyon streams cascading down, and by this point, you’ve done enough river crossings that you are wet up to the knee-caps and welcome the slog through rushing mountain water. I think we were there on a Tuesday during the early afternoon because as we stomped through the water we acknowledged how lucky we were to be in the wild depths of the canyon instead of in the wilds of conference rooms at work. Sorry! 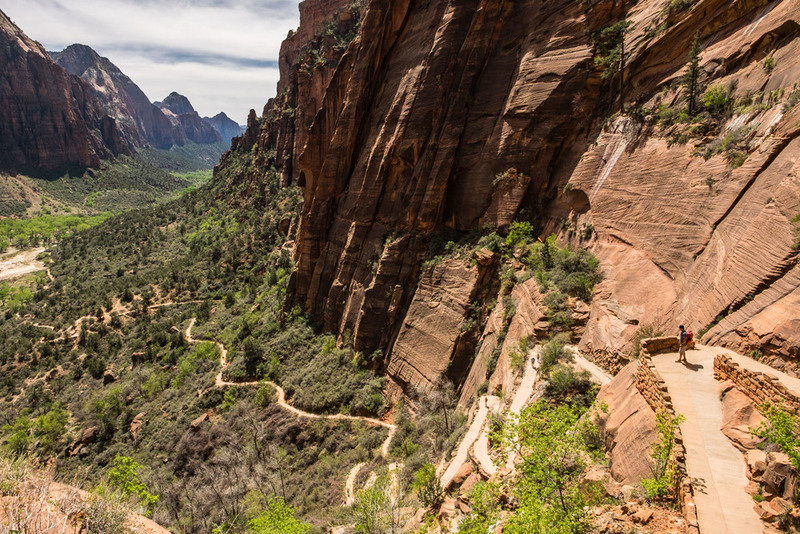 In any event, this hike is a can’t miss in Zion. Permits are required and run on a lottery, but they are free. Just plan in advance as only a small batch are allowed each day and this is a very popular hike – but not busy – thank you to National Park Service permitting! A peer down the Western Rim Trail en route to Angel's Landing and Scout's Lookout provides views of switchbacks zig-zagging down to the valley floor. 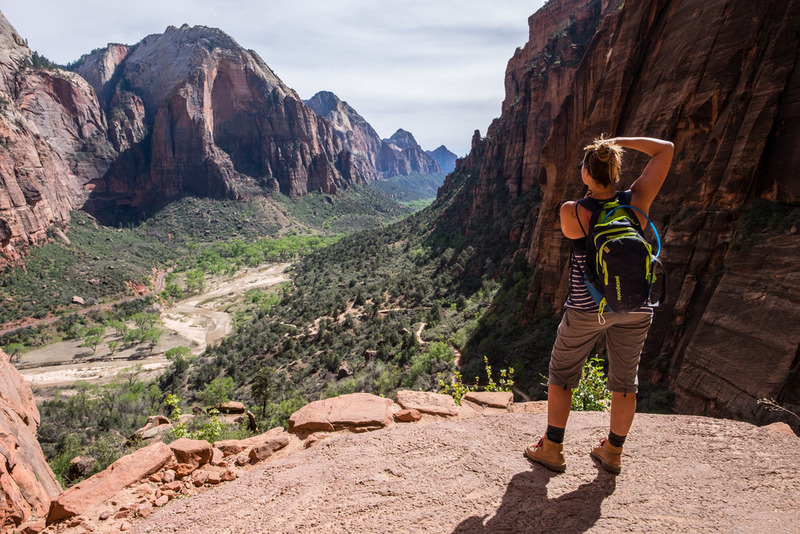 Angel’s Landing is THE classic Zion hike and is one of the most famous hikes in the world. The first four miles bring hikers along the West Rim Trail that leads to Scout’s Lookout from where you can take in the views while deciding whether you have the guts and desire to brave the final one-mile climb along the narrow canyon spine with support chains in hand to the landing. This last section is not for those who fear heights, exposure, and crowds while at serious heights while facing exposure. Fatalities are not common but they have occurred, and like all hikes and adventures in any national park, safety is the responsibility of the traveler. If you don’t feel comfortable climbing a cliff-face (you are not alone), don’t do it. You can still enjoy the hike along the West Rim Trail. There are incredible views the entire way up to Scout’s Landing—the switchbacks criss-crossing the valley floor are incredibly photogenic. 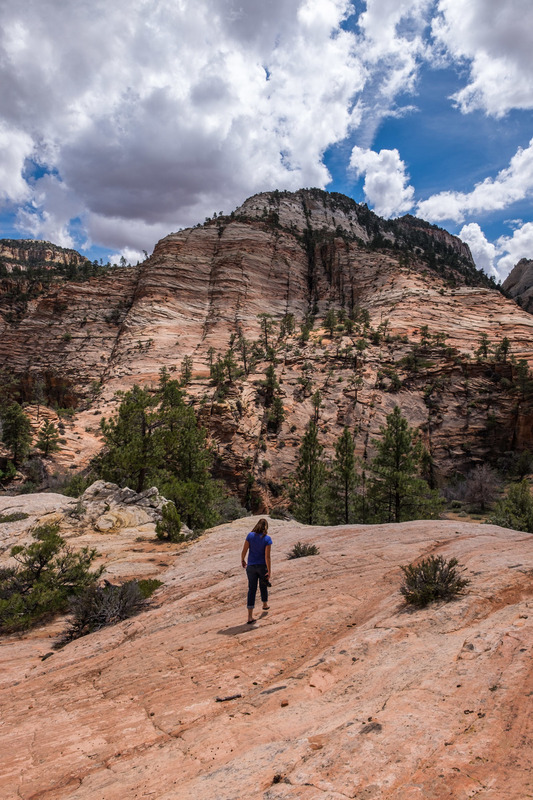 If you are well-matched for a climb to the high peak, you will reach 1,500 feet and views of the entire valley, and can count yourself a member of the I Hiked Angel’s Landing club. 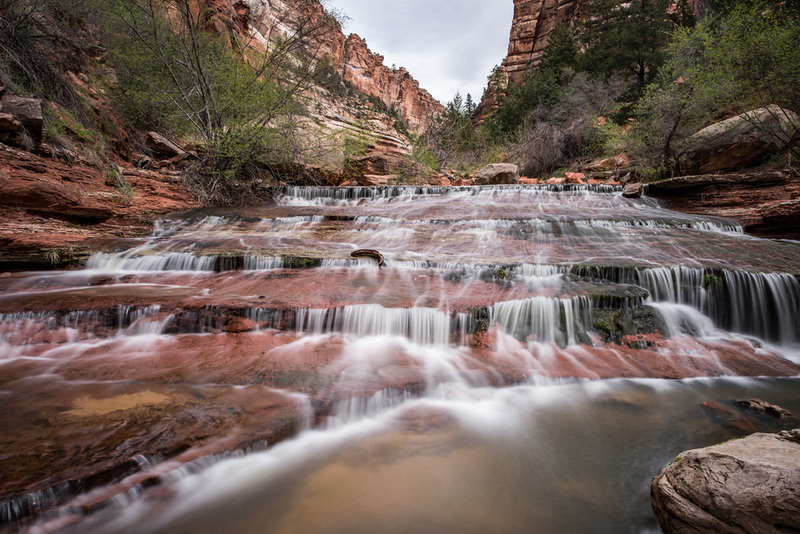 An enchanted waterfall at the middle section of Emerald Pools. It's awesome to be able to stand behind the falls. This is a choose-your-own adventure area in the park with three main hikes among lush vegetation leading to different water features at each. The lower pool is perfect for those desiring a relaxed wander and for those with strollers and wheelchairs, ending at a collection of mountain streams and small pools. The middle trail is a more moderate hike gaining 150 feet leading to an overlook of the pools found on the lower trail and small waterfalls; and the upper pool is a strenuous climb up 350 feet to a waterfall that streams down from a cliff. What we love about this area is that it's easy to access and an easy place to capture nice photographs ... and you can also walk behind waterfalls -- what's not to love!? Zion: a river runs through it. And you can walk on water through the Virgin River while exploring it. This is an iconic hike in the park and it is easy to know why after braving it. Decked out in a dry suit—Zion Outfitter in the nearby town of Springdale can hook you up with water repellent gear and info—you will make way on foot along a 30-mile wide riverbed beneath limestone canyon walls towering 1,000 feet above the way early explorers and natives once did. There is no trail so-to-speak, the trail is the riverbed. Sublime! Permits are required and water level and weather are factors in whether or not a visit there is possible as flash floods in the park occur often during peak season and are a danger. 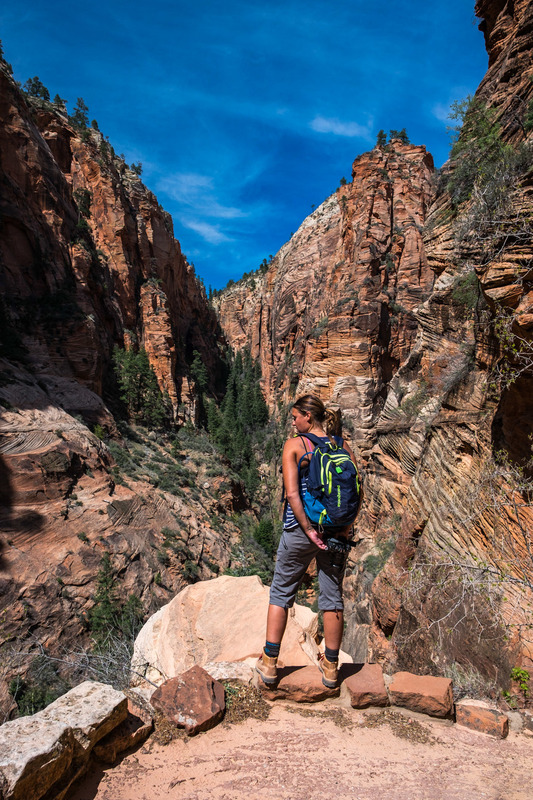 Unfortunately, we had to miss the Narrows hike this year due to spring runoff from snowmelt, but we've done it before and can unequivocally say it is one of the best experiences to have at Zion. Photographers line up to photograph the Watchman at sunset. Can you spot Jonny? He nabbed the best spot on the bridge! Guarding the southern entrance of the park, the Watchman is arguably the most iconic scene and provides some of the best sunset photography in the park. There is a 3-mile trail leading to a lookout of the towering peak, but this entry refers to the viewpoint as seen from Canyon Junction, with the Virgin River winding right through the middle of the scene. It is so picturesque that you might even feel compelled to put your camera down for a moment to simply admire the landscape. So much beauty in one peripheral spot is almost hard to take in, and even for photographers, can command full attention. Get there early to settle in with other shutterbugs as the sun falls against the red rock and the seafoam-colored water. 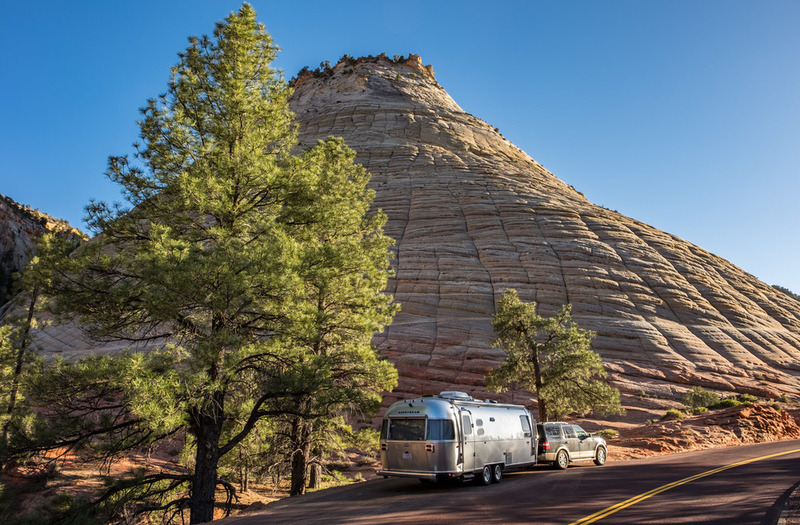 Wally the Airstream took several long wanders along the Zion-Mt. Carmel Highway. To go through the tunnel, we had to force one-lane traffic... apparently this is common in the park -- the rangers had the exercise down to a science. Cruising the 6-mile Mt. Carmel Highway through the park provides visitors easy access to viewpoints while offering that windy-road experience that also makes for magnificent on-the-road shots. 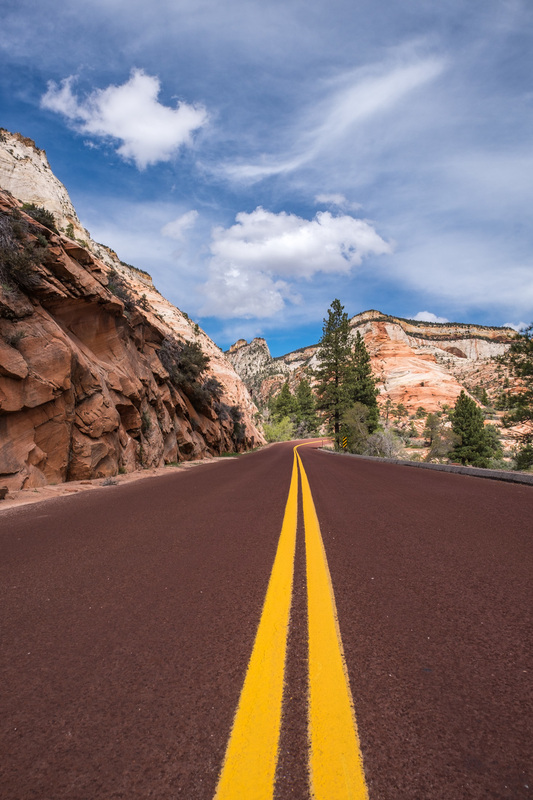 It is paved well (smooth), easily accessible throughout the most popular area of the park, and the richly brick-colored highway with canary-yellow stripes plays really well visually against the soft color of the canyons. A few miles along the highway up from the Visitor Center you will cross through the Mt. Carmel Tunnel, completed in 1930, a landmark with a rich history that at the same time allows modern travelers like us all passage THROUGH a mile of canyon in what feels like the dark of night. It’s a trip to travel through a canyon. 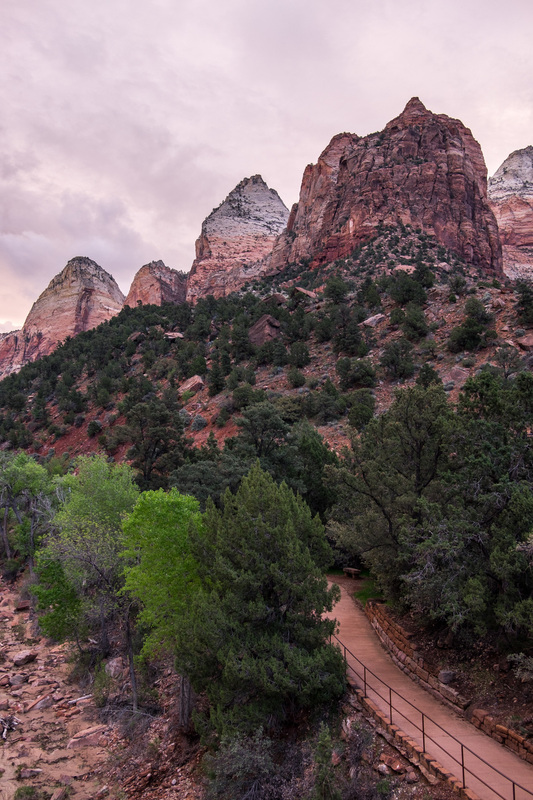 Step out of your room at the Zion Lodge and THIS is the view. There is no better place to stay in the park for immediate access to beauty. During the majority of our road trip this year we are living in Wally the Airstream, but every once in awhile there is an iconic park lodge ran by independent concessioners that we feel we must patronize in order to get the full experience. For all of the bells and whistles of a visit to Zion, the Zion Lodge is unmatched in terms of location and class. You can walk outside of your room in the morning, look skyward, and get views of the park that have awed visitors for over a century. A Historic Hotel of America, Zion Lodge is located in the heart of the park and provides any amenity you could desire, and the large oak tree in the middle of the grassy area in front of the lodge makes you want to lay out a blanket and relax the day away beneath Mother Nature's best work. We recommend positioning your stay at Zion Lodge or south of the park in the town of Springdale, where you can find a U.S. Post Office, Zion Outfitter (the resident leaders aside from the Park Service in outfitting and providing information for park adventures), and great restaurants like the Bit & Spur (upscale Mexican,) Cafe Soleil (awesome breakfast and coffee,) The Pioneer Restaurant (classic diner breakfast!) and Jack's Sports Bar, where we found the staff to be every bit as knowledgeable about the park as anyone in the area, as they are mostly seasonal workers and are really in Springdale to enjoy the park when not working anyway. Zion National Park poster art circa 1938. Courtesy Library of Congress. 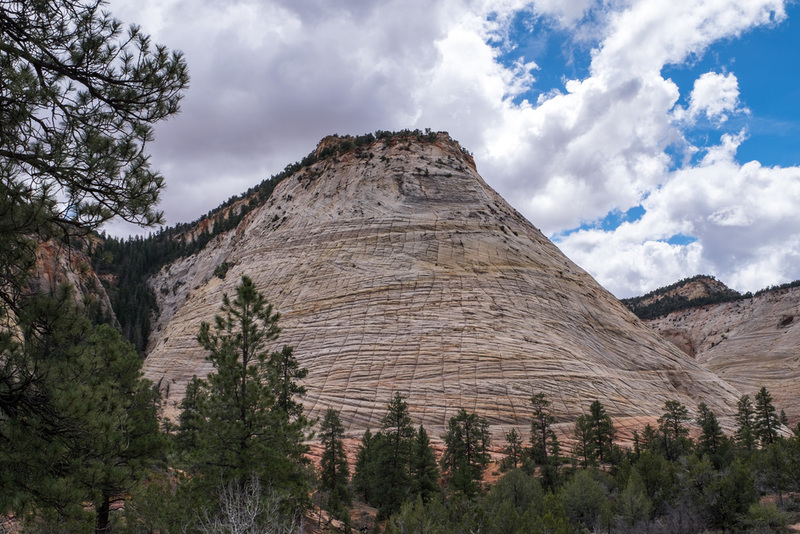 How the park got its name: The parkland that we now call Zion was occupied by the Anasazi people and Paiute Indians until the 1860s when a Mormon settler named Isaac Behunin came to the area. About the heavenly place, he remarked: “These great mountains are natural temples of God. We can worship here as well as in the man-made temples in Zion, the biblical heavenly 'City of God.'" 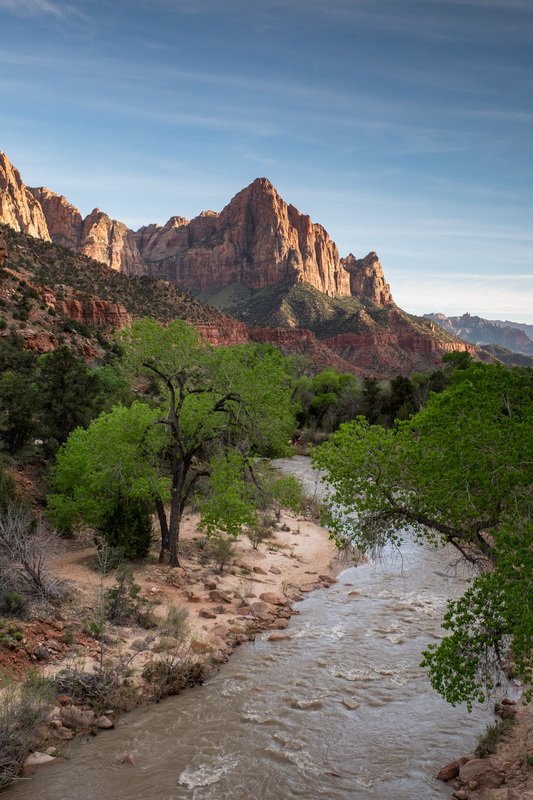 A short time later, Mormon leader Brigham Young came to the area and didn't agree with the naming convention, so the park began to be referred to as "Not Zion" or "Little Zion." In any event, the name Zion took. In 1909 President William Howard Taft set aside Zion as a National Monument under the name "Mukuntuweap National Monument." About a decade later, the acting director of the National Park Service reclaimed the name given to it by Morman pioneers, Zion. View along the West Rim Trail en route to Angel's Landing. Iconic site in the park: We're giving this to two iconic spots—Angel's Landing, and for those who don't love big climbs among sheer drops and exposure, The Watchman. Another iconic site in Zion is the view from the Canyon Junction Bridge looking onto the Watchman spires and the very green Virgin River that seems to wind right up to the base of them. This is the most recognizable, most photographed, and arguably the most prized sunset viewing spot of any location in the park. The middle section of Emerald Pools. 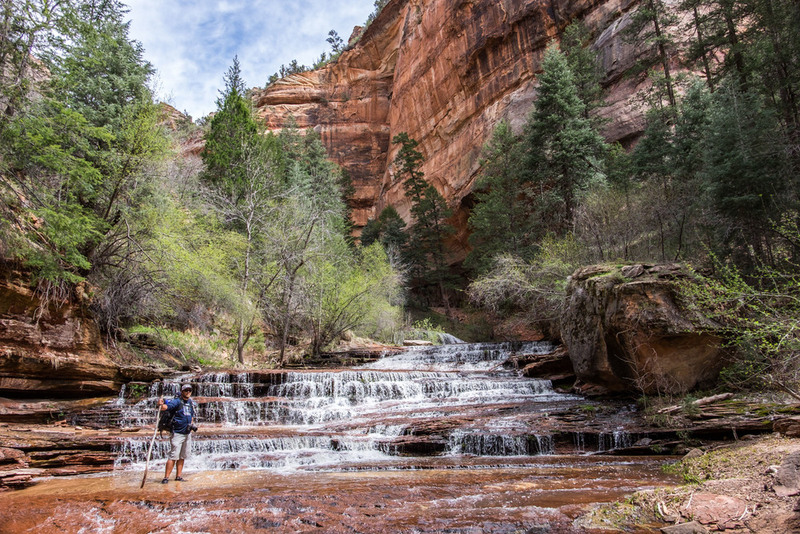 Accessible adventure: The Emerald Pools trails are located just across the street and in walking distance from the Zion Lodge and right along the free shuttle route, offering visitors easy access to one of the most popular areas to explore in the park. Perhaps it is because of its ease-of-access that it is so popular. Three hikes await at all levels of difficulty—the lower pools climbing 70 feet are accessible to all including those with strollers and wheelchairs where they can explore lush vegetation and mountain streams and pools; the middle trail climbs 150 feet giving access to viewpoints of the lower pools and to some smaller falls; and the upper pools are reached from a more strenuous route climbing 350 feet to the base of a waterfall that cascades down from a cliffside. 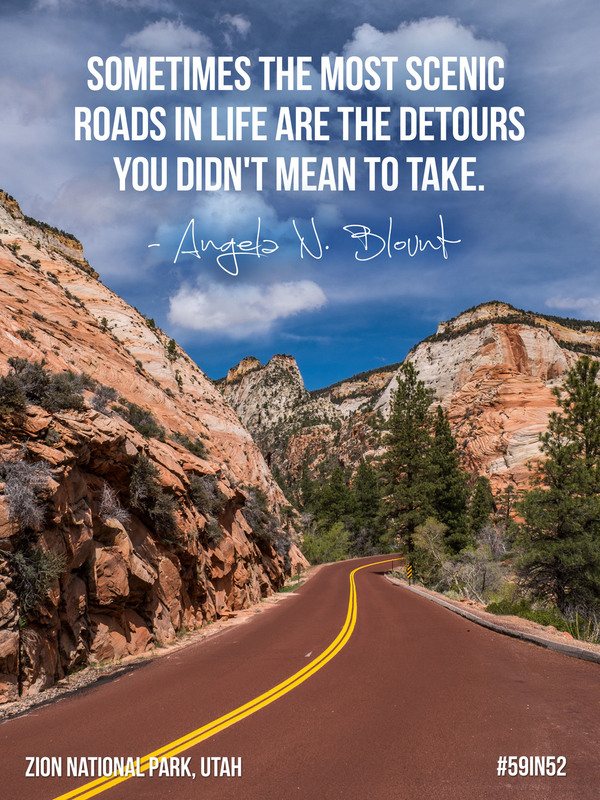 All can go together then choose how the rest of their adventure unfolds! Stef shrinks in size beneath the remarkable "Subway" in Zion's Kolob Canyons. 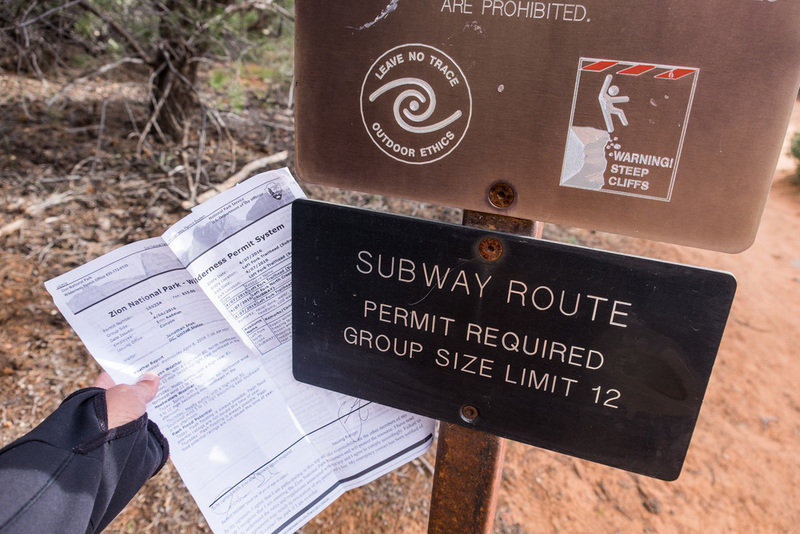 Big adventure: To explore some of the lesser known wilds of Zion, head to the northwestern side of the park at Kolob Canyons with a free permit in hand to head off on the Subway hike. 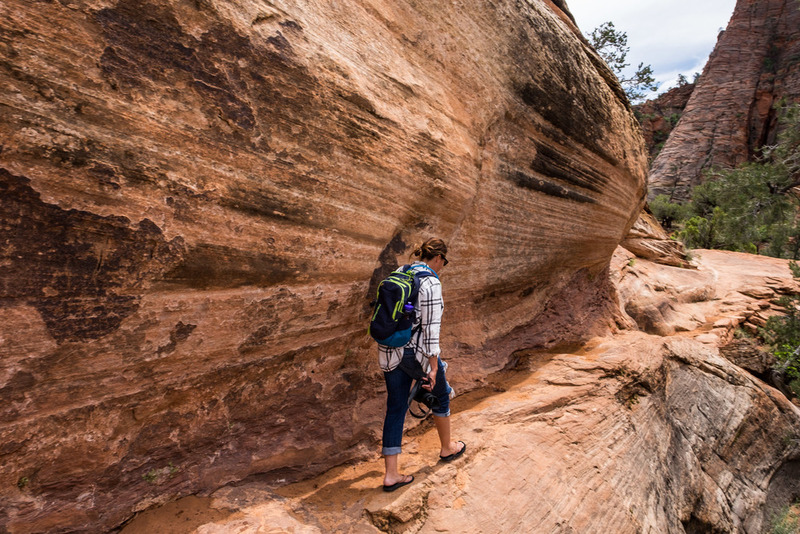 There are two routes—the top-down trail which is beloved by canyoneers and requires technical climbing ability; and the 9-mile bottom-up hike which gave us a full day of total hiking bliss. On this trail there is route finding, river crossing, bouldering, overland trekking, walking through cascading mountain streams, all ending at a massive geological feature that truly looks like the basement trains that course beneath any major metropolitan city. This hike is diverse, challenging and immensely rewarding both in experience and photo ops provided. It is also very popular and obtaining a mandatory permit can be a challenge. If you plan in advance, though, you will find yourself exploring some of the best and most peaceful backcountry nature that this park has to offer. The Zion-Mt. Carmel Highway and Tunnel. The tunnel was completed in 1930 as a way to expand access to the park. In 2016, 300 people walked through the mile-long tunnel on the Mt. Carmel Highway in celebration of the centennial anniversary. According to NPR, the tickets were snatched up in four hours. 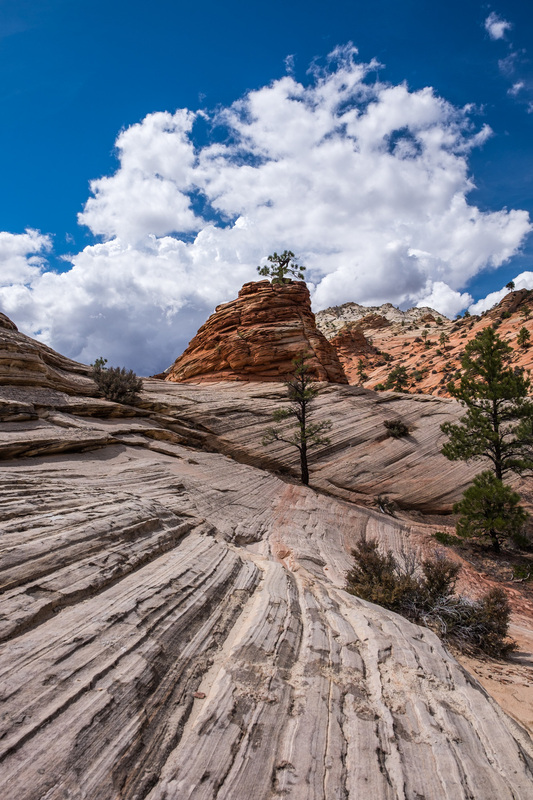 Zion wilderness provides a home to desert, woodland, riparian, and coniferous forest ecosystems making for a really diverse and exciting landscape to explore. 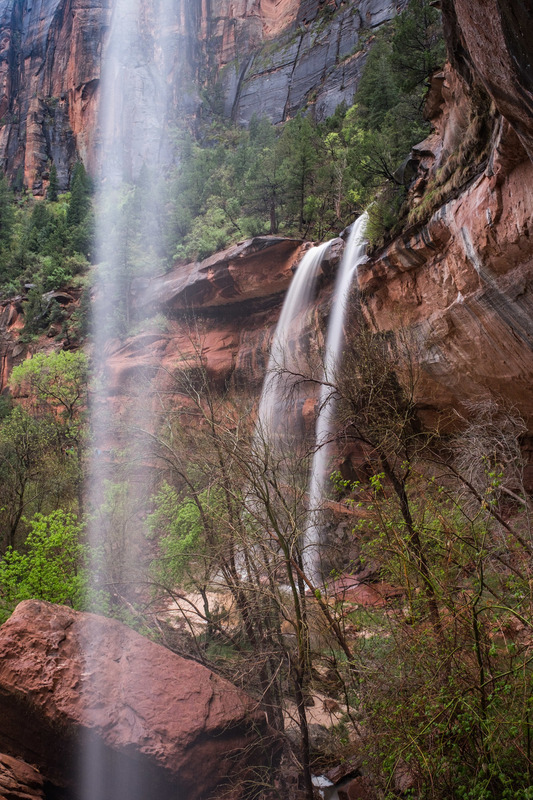 Flash flooding due to rain and snowmelt may prohibit a visit to many of Zion's most popular hikes. Have your weather apps handy when hitting this park, and check out the current conditions on National Park Service Zion website prior to planning any outdoor adventure. We missed the Narrows during this visit because of weather.... but we are finding that this is one of the outstanding things about all of the parks in the network -- there is always a reason to go back. 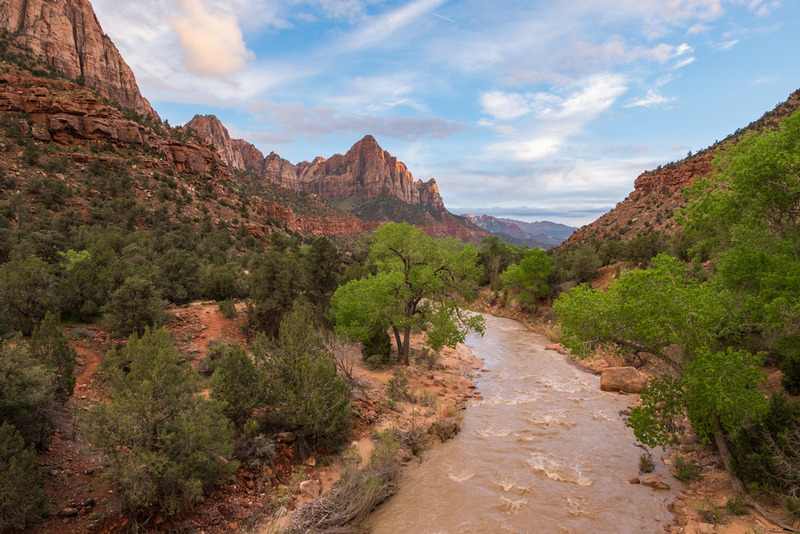 In 2009, President Barack Obama signed the Omnibus Public Land Management Act of 2009, adding 124,406 acres of parkland as Zion Wilderness. We are 100% for the addition of protected wilderness spaces! 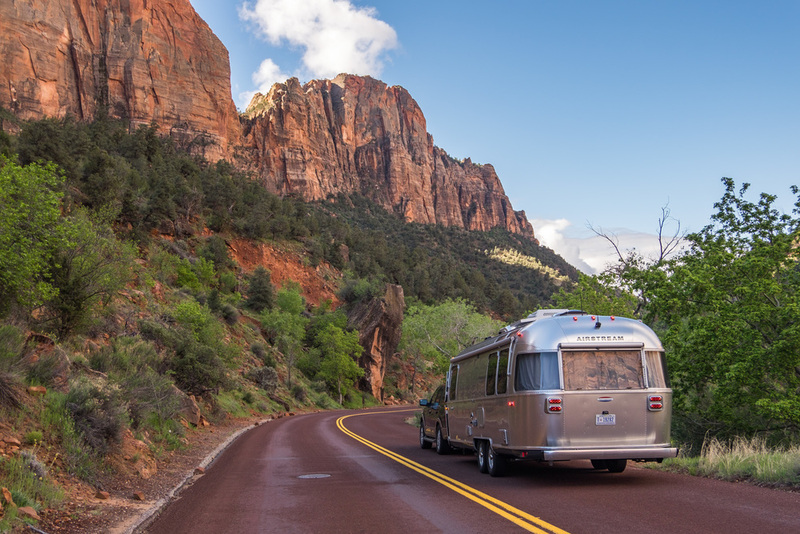 In 2000, the Zion Shuttle system was implemented, reducing congestion at the most popular places in the park, making it easier for all of us to get around. Hear, hear public transportation! 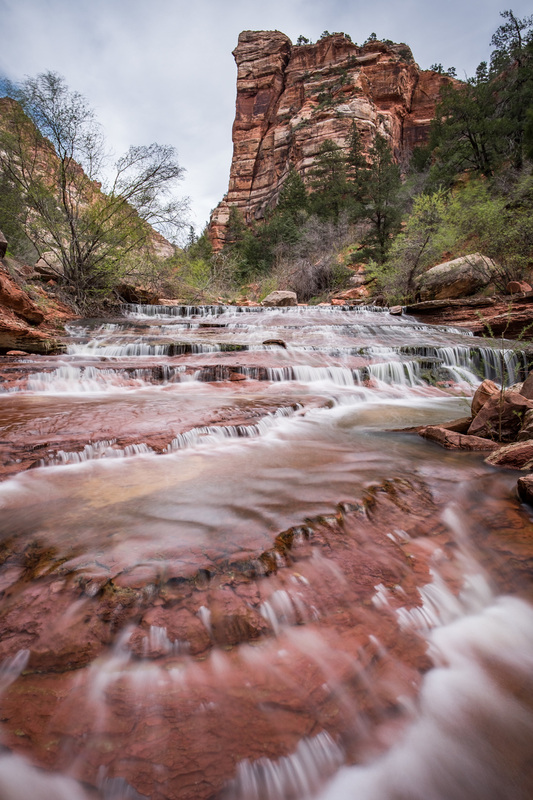 While Angel’s Landing might be the most harrowing hike in the canyon with a trail along sheer cliffs with huge drop-offs, it is the relatively accessible Emerald Pools hike that wields the most fatalities. Mountain water seeps out from rock walls creating a phenomenon known as "weeping." It can be seen all over the park and is most active during spring runoff from snowmelt. One of the best places to view this is at the appropriately named landmark, "Weeping Rock." Checkerboard Mesa. Simply marvelous, the intricacies of this rock! In an effort to reduce waste and promote sustainability, water refill stations are located all over the park and plastic water bottles are available for purchase everywhere you look. Zion is not known for arched canyons the way some of its neighboring parks are, but in a remote area of the Kolob Canyons stands one of the largest free-standing geological arches in the world, measuring 287 feet long. The longest arch in the world is Landscape Arch, located at Arches National Park in Moab, Utah. The Utah Parks Company who was contracted to build the Zion Lodge in 1924 wanted it to be a large hotel, while Stephen Mather – the first director of the National Park Service – wanted a smaller development. Ultimately the build was a compromise in size when originally built. 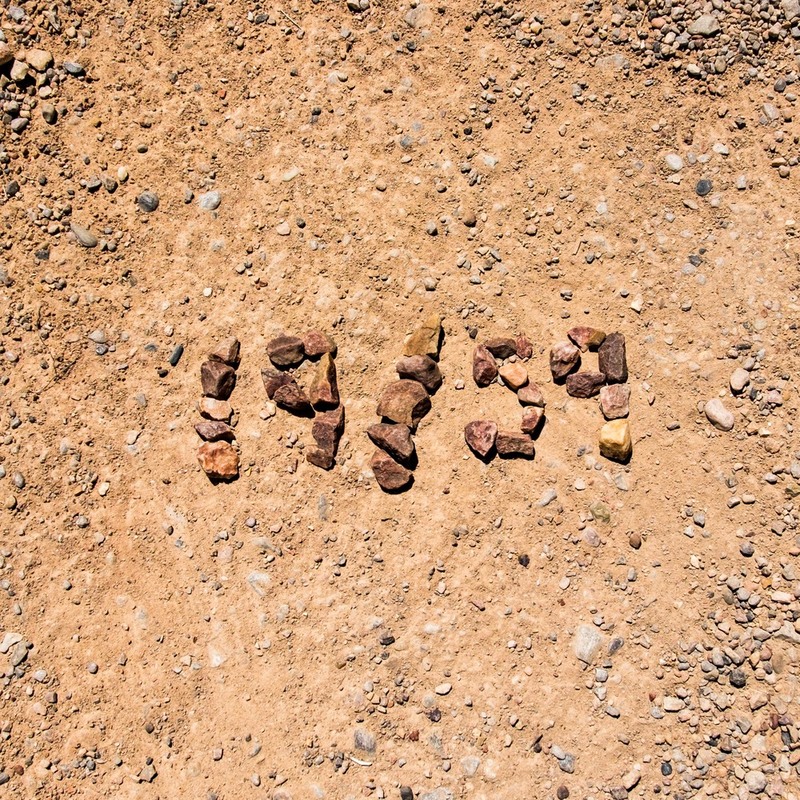 A fire in 1966 wiped out the lodge and it was quickly rebuilt (in just 100 days.) A restoration project in 1990 returned it to its original design. There are wild turkeys wandering all over the park and they are huge! Nearly 4 million people went to Zion last year. Much of the 1969 film "Butch Cassidy and the Sundance Kid" was filmed in Zion National Park. Jonathan on a previous visit to The Wave in Vermillian Cliffs outside of the park. Have you ever heard of The Wave? It is a geometric wonder located in the Vermillion Cliffs and is on every nature photographers bucket list. The U.S. Bureau of Land Management runs the show giving out permits to just ten people (people, not parties) a day. The lottery office is located in Kanab, Utah, and the drawing starts at 9 a.m. sharp each morning. 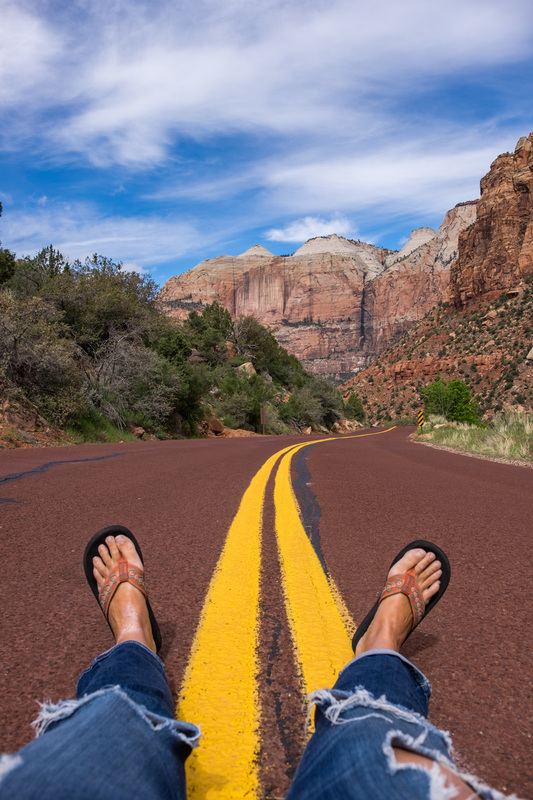 A lot of people head to Page, Arizona, to be close enough to get there in the morning, but Zion National Park is just as close, about an hours drive away. We went three days in a row to try to get access so that we could create for you an incredible Stops Along The Road story, but alas, luck was not on our side on this attempt. Jonathan has been twice before, pictured right is a pic from his last visit.